Eleonora Goldoni is from Ferrara, Italy, where she started playing soccer at the age of seven. Apart from playing soccer for ETSU, she has appeared in 10 games for the U-17 Italian National team, and 15 games for the U-19 team. She also assisted in leading the New Team Ferrar to a Serie C Championship, and has won two Futsal championships. At ETSU, Goldoni is majoring in Nutrition and is in her senior year. Since her collegiate debut at ETSU in 2015, Goldoni has broken the all-time career record of goals scored at ETSU with 36, and the season is not over yet. The previous record holder was Erin Ashton, who had 35 goals from 2002-06. Goldoni has been named to the SoCon Fall Academic All-Conference Team in 2016 and 2017, Southern Conference Student-Athlete of the Week in 2017 and SoCon Player of the Week in 2018. While at ETSU, Goldoni has traveled home at times to train with Italy’s U-23 team and the Italian senior national team. Goldoni has continued to be a huge asset to ETSU women’s soccer. 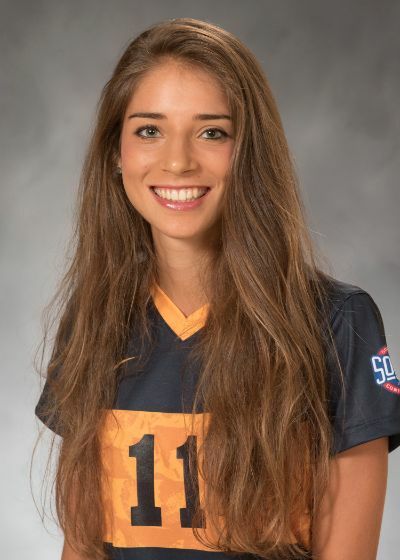 In the 2016 SoCon Tournament, Goldoni scored the game-winning goal in the quarterfinal, and could play a lead role in the team’s outcome against Mercer in the first round of the SoCon Tournament this Sunday.